Lyme disease is caused by infection with a bacterium called a spirochete (Borrelia burgdorferi) and is transmitted to humans by infected ticks (Ixodes scapularis and I. Pacificus). Patients with early stage Lyme disease have a characteristic rash (erythema migrans) accompanied by nonspecific symptoms (for example, fever, malaise, fatigue, headache, myalgia, and arthralgia). Lyme disease can usually be treated successfully with standard antibiotics. The U.S. Centers for Disease Control and Prevention (CDC) released the results of a six-year survey study of Lyme disease from 1992 to 1998. During this period, a total of 88,967 cases of Lyme disease were reported to CDC by 49 states and the District of Columbia, with the number of cases increasing from 9,896 in 1992 to 16,802 in 1998. The researchers concluded that the increase in reported cases is probably a result of both a true increase in incidence within known high-risk areas as well as more complete reporting as a result of enhanced Lyme disease surveillance. They noted that surveillance capabilities and public awareness of Lyme disease have increased during this period. Researchers also note that Lyme disease remains underreported with an estimated seven to 12 cases for each reported case. Lyme disease is a bacterial illness caused by a bacterium called a spirochete. In the United States, the actual name of the bacterium is Borrelia burgdorferi. In Europe, another bacterium, Borrelia afzelii, also causes Lyme disease. Certain ticks found on deer harbor the bacterium in their stomachs. 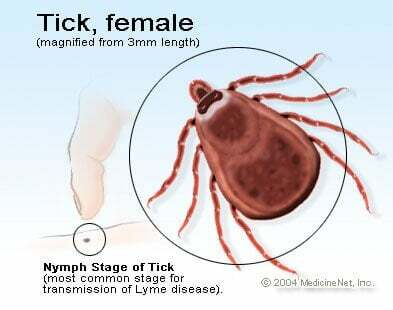 Lyme disease is spread by these ticks when they bite the skin, which permits the bacterium to infect the body. Lyme disease is not contagious from an affected person to someone else. Lyme disease can cause abnormalities in the skin, joints, heart, and nervous system. What Is The History Of Lyme Disease? Interestingly, the disease only became apparent in 1975 when mothers of a group of children who lived near each other in Lyme, Connecticut, made researchers aware that their children had all been diagnosed with rheumatoid arthritis. This unusual grouping of illness that appeared "rheumatoid" eventually led researchers to the identification of the bacterial cause of the children's condition, what was then called "Lyme disease" in 1982. Ticks are carriers of the Lyme bacterium in their stomachs. The ticks then are vectors that can transmit the bacterium to humans with a tick bite. The number of cases of the disease in an area depends on the number of ticks present and how often the ticks are infected with the bacteria. In certain areas of New York, where Lyme disease is common, over half of the ticks are infected. Lyme disease has been reported most often in the northeastern United States, but it has been reported in all 50 states, as well as China, Europe, Japan, Australia, and parts of the former Soviet Union. In the United States, it is primarily contracted in the Northeast from the state of Maine to Maryland, in the Midwest in Minnesota and Wisconsin, and in the West in Oregon and Northern California. What have you heard about tickborne Lyme for the last 30 years? That it's rare, scary, acute, treatable" The government warns about its spread and implores people to go to a doctor upon seeing the telltale bulls-eye rash. What happens when they actually do? Many have researched the controversial beginnings of Lyme disease, but this article focuses on what happens to victims when they contract it and what they can do now. Under Our Skin is a documentary that lends a voice to the many who in fact suffer from chronic Lyme and are victims of a greater abomination. Why do conventional doctors tell them it's in their head? Why won't they quickly test for it? Treat it? Acknowledge it? Why do medical boards shut down doctors who can treat and cure Lyme? In the late 70s, a Lyme, Connecticut mom reported a mysterious new disease sweeping the town, leaving its people with debilitating, chronic symptoms. In 1981, Dr. Willy Burgdorfer discovered the Lyme bacteria, called Borrelia burgdorferi. The bacteria spirochetes closely resemble syphilis in their make up. While a carrier tick is feeding, its backwash enters the host and transmits Lyme. The corkscrew spirochetes wreak havoc, drilling into any healthy cells and tissue. They create painful, crippling neurological and immunological damage. In the beginning, doctors only knew that it resembled syphilis but remained unaware of its wide spread, how to proceed, and the political, medical clash that awaited them. In recent years, the CDC has reported over 35,000 new Lyme cases annually but admit that since it is so overlooked the actual number may be 12 times higher, up to 420,000 cases each year. Think of how much more likely it is to contract Lyme than the media-touted West Nile virus which is only reported at around 1,300 cases annually. If the actual number of Lyme cases is even just a modest amount above the CDC's 35,000, then Lyme is far more prevalent than AIDS, reported at 39,000 cases annually. Since 1982, the number of cases continues to climb and spike prompting media reports and health officials to label it epidemic as early as 1989. Reported cases have tripled since 1992. Every summer we hear the same cautionary reports. Yet doctors constantly tell their patients "You don't have Lyme" or "Lyme only happens in such-and-such state, not here." Lyme Is A National Health Crisis In Every State And Has Traveled The Globe! Since this infectious disease is viewed with eyes that won't see and hands that won't treat, the miniscule 35,000 reported cases are unquestionably a mere fraction of people sick with Lyme. Patients often look normal and are told they have M.S., Lou Gehrig's, psychological disorders, Parkinson's, ADHD but not Lyme. Therefore, many walk around with Lyme and have no clue why they are so ill, why treatments don't work and are left to wonder. Many are left to die. Lyme patients often state that they've seen an average of 30 doctors, spent over $100,000 in medical care and waited up to 15 years for a Lyme diagnosis. Why?? Lyme disease antibodies can be detected early with a blood test. If caught early it can be treated with an inexpensive bottle of antibiotics. But that is rarely the case. Patients are told it's not Lyme, it won't be tested for, it's something else and so the struggle begins"
When the patient remains ill, why, it couldn't possibly be chronic Lyme because doctors view it as acute and are not allowed to believe chronic Lyme exists. If "acute" Lyme isn't cured with two weeks of antibiotics, which it won't be if the bacteria has taken hold due to waiting, then the patient is told it must be something else and years of sickness, pain, and ineffective treatments ensue. Talk to someone who's been through this battle. They will most likely tell you they were dismissed, referred to psychiatrists and multiple specialists. Lyme can attack any area of the body and manifest endless symptoms. Lyme patients have seen specialists for chronic pain, arthritis, Chrohn's, iritis, organ failure, brain and neurological problems, dyslexia, insomnia" you name it. All for one disease that could have been treated early. But no one will believe them and after seeing so many specialists they are often labeled crazy, hypochondriacs, attention loving, and depressed. The spirochetes can cleverly avoid the antibiotics and hide from the immune system. It's frightening to think that specialists often prescribe immune suppressive drugs - the most counterproductive plan for Lyme patients. The CDC now hints at chronic Lyme with sarcastic quote marks and insists that it be called Post-Treatment Lyme Disease Syndrome (PTLDS). They openly admit that the first round of conventional treatment might not bring a cure and that the patient is in for a long ride of pain and sometimes years of antibiotics, the only recognized conventional treatment. They LIE and state that there is no credible scientific evidence that PTLDS is caused by persistent infection, that it must be residual damage, that the Lyme is gone. They also make a big point in telling people to avoid their own research on the internet, not to believe the inaccurate information out there, just keep seeing the doctor who left them untreated for so long. The CDC says before PTLDS treatment takes place, confirm the diagnosis - fat chance that will happen. So how did that fiasco begin? What's commercializable is driving the research agenda in too many cases. Not what's medically necessary and what's medically useful. In 1980, the government started allowing patents on living organisms like pathogens. Perfect timing for scientists to make a mad dash for parts of newly-discovered Lyme and keep the information locked to protect future profits. These so called experts research it with federal funds, then start private firms and patents. They write guidelines for insurance companies and HMOs so that the disease doesn't exist (yet) or require coverage. Not only do Lyme victims spend hundreds of thousands for medical treatment, but they can't be covered for Lyme! The Infectious Diseases Society of America (IDSA), made up of a board of doctors, created within themselves an authority to write the rule book on all things Lyme. It is the absolute bane of both the Lyme community and conscientious doctors everywhere. They are the ones who decided that there is no chronic Lyme, that it's easy to treat and cure, and will be cured within two weeks of oral antibiotics or else the patient has another infirmity. Doctors must follow their diagnosis and treatment guidelines or face punishment from state medical boards. Patients' proof of cure never sways the boards - doctors broke the rules. Out of the 400 references listed in the back of the guidelines, over half of them are directed at articles that they and their teams wrote. They have closed the door on outside contrary research. These are the very guidelines insurance companies consult to deny medical treatment coverage. The majority of complaints that lead to doctors' suspensions come from insurance companies, not patients or other physicians. The insurance companies wish to rid doctors who cost them the most. The trio of insurance companies, Lyme guidelines, and Big Pharma restrict consumer choice in medical care and extort these patients. While the IDSA acknowledges post-Lyme syndrome, they audaciously attribute it to the "aches and pains of daily living" and that poor treatment results are due to prior traumatic stress. Are they really that dumb? No, but they are cold blooded and know exactly the nature of the disease and its destruction. Busted On The Money Trail! Connecticut Attorney General Richard Blumenthal investigated the ISDA panel members for possible violation of antitrust laws and conflicts of interest. Of the 14 panel authors of the first edition guidelines: 6 of them or their universities held patents on Lyme or its co-infections, 4 received funding from Lyme or co-infection test kit manufacturers, 4 were paid by insurance companies to write Lyme policy guidelines or consult in Lyme legal cases, and 9 received money from Lyme disease vaccine manufacturers. Some of the authors were involved in more than one conflict of interest. So why are guideline authorities taking money from companies who have a direct interest in specific outcomes? When will doctors speak up? So How Does This Cover Up Saga Continue? The media keeps trumpeting the lies. CBS News recently published a story called “Lyme Disease Lies - And Truths.” Each segment features a FACT OR FICTION tidbit which is really a confusing mash up rife with deception. They pull their information from the IDSA and Dr. John Halperin who wrote a book better used for toilet paper called Lyme Disease: An Evidence-based Approach. The article calls the following liars: people who claim to have "chronic" Lyme disease, those who believe they still have Lyme because they test positive for antibodies after treatment, those who believe their brain fog results from Lyme, the Lyme "advocacy groups" that claim anyone actually died from it, anyone who claims this syphilis like disease is spread sexually, and those that believe lengthier care is needed. Dr. Halperin states that Lyme is benign, easy to treat, no one has died from it, are rarely hospitalized, and brain infection from Lyme is rare. Doctors like Leo Galland are stepping out with more truth. His article on Huffington Post discloses more about chronic Lyme infection. At the bottom of his article, you will see that the majority of the 500 comments are Lyme victims sharing their nightmare stories. Organizations that pretended to protect public health with no commercial interests (CDC, NIH, Universities) partner with Big Pharma and are not in the business of seeing anyone healed. Maybe generations from now when there is enough of an outcry, when many have lived ill and died, some drug company will try to be the hero of the day and come up with a poisonous drug to treat Lyme. Even that scenario is highly unlikely as chronic Lyme is not allowed to exist. But when it does there will be a vaccine waiting for you. So tragically in the meantime, Lyme victims serve as a host for the parasitical medical establishment, lining the coffers until they are bled completely dry. The real ticks (the poli-ticks) are still here. Watch Under Our Skin for more mind blowing information. Find out about the doctor who discovered an actual link between the Lyme spirochetes and disorders like dementia, Alzeimer's, M.S. and more. One alternative health practitioner has not seen one M.S., ALS or Parkinson's patient in the last five years who did not test positive for Borrelia burgdorferi. You will also see proof that Lyme inflicted mothers experience multiple miscarriages and their babies are riddled with the disease. Babies who survive often develop late stage neurological damage during childhood and adolescence. All events that the IDSA swear have never happened. They insist that Lyme cannot be spread to the unborn child. You will witness the families grieving over their dead loved ones. Lyme Disease is listed on their death certificates. You will hear from doctors who were bullied, investigated, and ousted for attempting to actually treat Lyme, usually with intravenous and lengthier antibiotics. After all, isn't that how other infectious diseases are conventionally treated - Tuberculosis, HIV, Hepatitis? Conscientious doctors have to treat Lyme secretly if they want to help their patients without losing their license. They have to tell their patients, "Don't mention Lyme." How's that for a cover up? So What Now? What If I Have Lyme? Chances are, you know someone who is manifesting the aforementioned symptoms and is battling the never ending circle of finding proper diagnosis and treatment. They may or may not remember a tick bite. Since the truth about Lyme is so stifled it is more than likely spread through blood transfusions (as with Babesiosis) and shared between couples (as shown in Under Our Skin). They most likely have been diagnosed with one of the mysterious "incurables" like MS, ALS, or even early Parkinson's and Alzheimer's. The latter two are increasingly diagnosed in younger patients. Or perhaps they were dismissed as crazy and bear the misery of not knowing that they actually suffer from Lyme. Regardless, they suffer and believe they must wait until research catches up to them before they die. The Infectious Diseases Society of America wrote guidelines on tickborne diseases that included Lyme, Human Granulocytic Anaplasmosis, and Babesiosis. HFA reported the rise of Babesiosis, more threatening in its lack of early symptoms and undetected presence in blood supplies. So anyone suffering from tickborne infection is going to have the same run around as Lyme victims. Those with the malaria-like Babesiosis parasite can also have Lyme and vice versa. The political-medical battle over Lyme (and Babesiosis) was left to the dogs from the beginning. Many have struggled and found their own way, with alternative doctors and unconventional methods. The CDC would like you to believe that such unfortunates stumble on "goat's blood" and false promises of stem cell help, but we know better than that. Unfortunately, Under Our Skin only covered doctors who were using aggressive antibiotic treatment for progressive Lyme. Even some of those doctors had their licenses revoked or were compelled to close their practice. Constant use of antibiotics are harsh and leave people with more health problems, possible resistance and Candida yeast overgrowth. Prevention is ideal but obviously not fail-proof. Good Naturopathic doctors have an affinity for detecting and treating bacterial and parasitical infections. This is why the absolute most important action we can take is protecting their rights to help their clients. It is no mistake that many states are introducing bills to criminalize alternative health practitioners. We need their knowledge and expertise more than ever…The FDA is always at work trying to snuff out the following talked about Lyme supplements. Oregano and colloidal silver have helped people with many aggressive infections such as Lyme, AIDS, and Tuberculosis. They are powerful bacteria and virus fighters and when used properly do not harm healthy cells unlike standard antibiotics. MMS is an intense bacteria and malaria destroyer. It has been a life saver for many in the Lyme community. The more clever bacteria types cannot use the host to evade MMS which destroys thick bacterial walls. Careful MMS use encourages rigorous toxin removal. Many online Lyme support groups prefer treatments like Rife technology and MMS for successful healing.